A New Yorker whose New York Times was routinely swiped from his Manhattan stoop became so annoyed by the thefts that he set up a camera and followed the thief, unraveling a scheme to steal newspapers from a wealthy 10-block area of the Upper East Side for resale at a bodega. Starting in February, Randy Mandel woke to find an irritating sight outside his 93rd Street door: his New York Times was gone, stolen before he could get to it. "We started missing the paper every single workday or the majority of the workdays in a week, and there was no pattern other than it was just gone every day," Mandel said. In July, Mandel mounted a surveillance camera on his window and caught footage of the paper being taken, but the thief’s face was obscured. So Mandel started following the man who was swiping his paper, using a still camera to snap blurry, pre-dawn photos showing him snatching papers from other doorways. And then, to his surprise, Mandel followed the thief to a bodega called M&S News near the corner of Lexington Avenue and 79th Street, where the man dropped off the papers. The bodega is just a few blocks from billionaire Mayor Bloomberg's home and is in one of the most expensive zip codes in the U.S. He followed the paper bandit to another bodega on First Avenue. It is not clear whether he dropped off newspapers there, but Mandel suspects both stores were endpoints in a scheme to steal issues from front steps and put them on racks for retail sale. 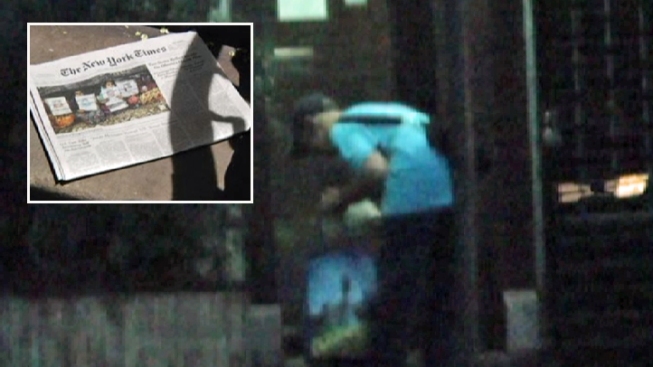 On two recent mornings, the I-Team tailed the newspaper bandit and witnessed the same pattern. The man, dressed in a blue shirt and hat and carrying a tote bag, zig-zagged door-to-door from 96th Street to 86th Street between First and Third avenues. He snatched copies of the New York Times, placing them in his bag. Along the way he paused to organize the papers, and then delivered a stack to that bodega near the corner of 79th Street and Lexington Avenue. When confronted about the thefts, the man – who identified himself as Bob Peters – denied he had stolen any newspapers and refused to look at video evidence, including one recording that clearly shows him ducking into a door on Second Avenue, swiping a paper, and briskly walking out with that paper in his tote bag. He said he was just a hired hand for the bodega. "I help the guy take the stuff and open up the store, that’s all," the man said. The manager of the bodega, Kaushik Patel, offered a different account. He said he paid the man $2.50 per paper each morning, but Patel insisted he had no idea the papers that had been swiped from neighborhood doorsteps. “I know the guy. He gives me the papers. I give him the money and I don’t know where he buys his papers,” Patel said. The New York Times sells for $2.50 on weekdays. Nehal Trivedi, an attorney representing the bodega owner, said his client is not responsible for the conduct of a delivery person, even if that delivery person was unlicensed. If the bodega owner was in the dark about the source of his newspapers, Mandel says he was willfully ignorant. “I think there should be some repercussion for the bodegas involved," Mandel said. Since the I-Team confronted the paper bandit, Mandel’s New York Times has arrived on his doorstep, untouched.